"You are not a fun mom!" is something most children often tell their mothers, because they wouldn't buy artificially coloured junk food for them. For a minute, sit back, and ponder if actually you are doing the right thing, inculcating right eating habits. Should you be worrying about my children, and them feeling left out compared to their peers? Don't get me wrong, I understand, and appreciate that children look forward to and enjoy eating a birthday cake or an ice cream; but we must also understand where to draw the line. We teach morals, kindness, manners to our kids but often forget the importance and the value of healthy eating and exercise. A child's attitude about food comes directly from parents, hence your role is vital. 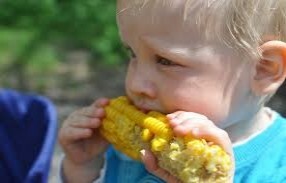 Have you ever told another parent that your child is a picky eater? Or takes too much time on the dinner table? Labeling your child will further cause them to turn away from fruits and vegetables according to a study. Most kids miss out on this important nutrient. Explain that their body needs water for sport and their brain needs water to concentrate. We want our kids to go for water when they are thirsty and not insist on sugary drinks. Keep juice and other sweet drinks as "sometimes" food and not everyday foods. Take them shopping and let them choose a new vegetable. One of the best gifts you can give your kids is to train their taste buds to enjoy many different flavors, not just sugar, fat and salt. Keep plenty of fruits, finger cut veggies, healthy beverages like coconut water, probiotic drinks, milk, chaas, pure vegetable and fruit juices handy. Do not stock unhealthy aerated drinks, chips or cookies. The childhood impulse to imitate is strong, so don't ask your child to eat vegetables when you gorge on chips. The simple act of talking to a parent over the dinner table about how they feel can play a big role in relieving stress and boosting your child's mood and self-esteem. Refrain from obsessive calorie counting or commenting on your own weight, so that kids don't adopt negative association with food. A 2015 study found that poor breakfast habits as a child actually predicted the risk of metabolic syndromes as an adult. I hope parents are getting the message here? If you are skipping breakfast, CHANGE! And set a good example for your child about the most important meal of the day. A 2016 study found that junk food and sugary drink are often used as rewards for doing well in school or sports. This sends wrong signals to children assuming that the junk is a hero and reward for their achievements. Physical activity is natural for everyone. Growing problem of childhood obesity caused by inactivity is a wakeup call for everyone. Be a part of your child's outdoor games and playful workout routines. Overburdened with vast curriculums, children are missing out on the happy hormones released as a benefit of exercise and fitness.